General Conference in Mannheim, Germany was everything and more that we planned, believed and prayed for. God filled 20 with the Holy Ghost; we had at least 35 confirmed miracles, and in one single service, we received a 20,801 euro sacrificial offering to send out the very first national missionary of the UPC of Germany and Austria to the country of Liechtenstein! We thank God for the faith, prayers and sacrifices of the saints and pastors in the German speaking nations! The Lord has been preparing the German speaking nations for a great revival like we have never seen before, and it is happening right now! In the last three years, having Bro. Howell, Bro. Stoneking & Bro. Klinedinst has helped us go repeatedly to new dimension of apostolic power! We thank God for His promises and His hand that is upon Europe in these last days! Thank you all for praying & giving sacrificially for many years to bring about this revival! One of the miracles during our conference was that the Apostolic Pentecostal Church in St. Louis, MO was directed of the Holy Ghost to take a sacrificial offering the same day we were taking ours to help the missions effort in Germany! They raised $7,400 in one service to help us send our first missionary to Liechtenstein! Praise God. Thank you Bro. Willeford and the great saints of the Apostolic Pentecostal Church! 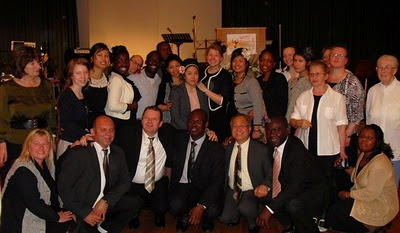 The month of June was a deﬁning moment for the Apostolic Ministry Training Center of German & Austria. The power of God fell upon the whole school and each and every person began to pray in the Holy Ghost until 7:30 that evening. The hunger and expectations of the students have begun to grow, and we know God has something in store for each and everyone of the students. We have been training for seven months and already the district has risen to a new level. For the last three months we have been meeting in Sis Constance’s Apartment for church. After three months of looking at different places to rent and always coming up short, on June 23rd Bro Robinette and I found a beautiful place to begin having church. 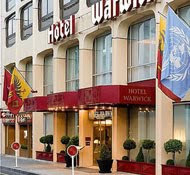 The Warwick Hotel, which is in the heart of the city, is right across from the train station and where all public transportation connects. For $190.00 a week we are able to rent a beautiful meeting room, which will seat between 30 and 50 people. July 4th we had our very ﬁrst service. We are believing that through the next 5 months, revival is going to happen like it never has in the city of Geneva. THE TIME IS NOW. PRAYERS HAVE BEEN PRAYED FOR YEARS AND NOW REVIVAL IS HERE! As an extension of the C.O.A. of Vienna, Austria, during the week of June 21st- 28th we were privileged in having 14 young people from America come to help us. During their time here in Geneva, they passed out 5,000 ﬂyers, engaged in personal evangelism on the streets, ministered to the church through singing, and had one on one time with church members as well. Never before has an evangelism effort of this size been done in the city of Geneva. On June 27th Pastor Raymond Wey from Mannheim, Germany, came and ministered to the church. What a powerful word from God! Things were birthed in the Spirit, as well as in the hearts of many of the people. With so many wonderful things happening, we are in need of your support. You will not want to miss this opportunity to be part of things that have never happened before!